Established in 1998, Concorde commenced its operations with a group plot of developers. Riding on the growth wave of real-estate, the group made a strategic shift into constructions of villas and apartments; from then on it transformed into a new breed of builders and carved an enviable niche for itself in the real estate arena, offering great quality of living spaces at extremely competitive prices. 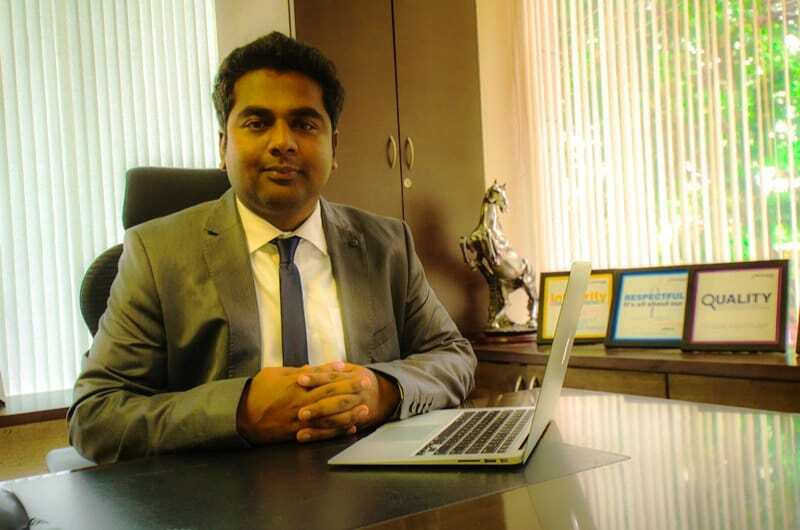 Mr R.G Sunil, Executive Director, Concorde Group spearheads the company’s expansion into fresh new verticals. He leads the vibrant chain of coffee outlets called Cuppa. Sunil brings with him a fresh way of looking at things, an inborn talent of multi-tasking mixed with tremendous enthusiasm and a now-or-never-spirit. All this makes for a potent combination in the business environment. Team Estrade: Give us an understanding of your company’s journey since its inception? Mr. R.G. Sunil: Concorde Group was established in 1998 by two visionaries, Mr. B. S. Shivarama and Mr. R. Gopal Reddy. The aim was to change the way people experienced comfort and luxury in their living environment and in just a decade and a half Concorde has developed over 18 million sq ft of residential space. Long lasting value for customers with benchmark quality, enviable locations and thoughtfully designed architecture are some of the attributes that sets us apart. As the city evolves, we are certain that Concorde Group will be a name to associate with success. Mr. R.G. Sunil: Concorde Crescent Bay, located on the Bull temple road near Basavangudi is an ultra-luxurious condominiums and an embodiment of fine living in Old Bengaluru. Flanked by the verdant view of Cubbon Park and Lalbagh, Concorde Crescent Bay carries an old world charm with modern allure. Concorde Crescent bay is designed as per international standards in 78 units of 3, 4 & 5 BHK apartments and tower standing high in neighbourhood of Chamarajpet and Jayanagar. Crescent Bay with its breath-taking views and the towering edifice, blended with traditional heritage of the area is a significant landmark of Bangalore. Team Estrade: How do you think realty firms would benefit from government’s flagship schemes such as ‘Housing for All by 2022’ and ‘100 Smart Cities’? Mr. R.G. Sunil: The launch of smart cities mission is not only expected to change the urban landscape of the entire country but would also give an impetus to the economy. Housing for all, is a milestone in Indian housing sector as every stakeholder would be benefitted by this step. As the cabinet gave approval on Housing for all by 2022 with salient features like subsidy for beneficiary led individual house construction, promotion of affordable housing, affordable housing in partnership with public and private sectors, this decision would be a boon for the less affluent section of the society and bring opportunities for the constructors to address them. Real estate got a break through to focus on the affordable housing category along with luxury and accessible segment. Team Estrade: Please share some insight on the current construction sector in your region. Mr. R.G. Sunil: Bangalore has been crowned as the fastest growing city, credits being given to IT and now the mushrooming start-ups as the major driver. This has resulted in the aggressive real estate development in the city. Bangalore has a multi- cultural population, immigrants recognising this as their own land giving real estate a new direction to magnify. It has become massive on the scale of management and administration leading to the growth in job opportunities for the locals. Real estate development has given people the opportunity to live near their work environment to avoid travel hassles. Many suburbs are now becoming attractive investment hot spots for property. Self-sustained localities are now cropping up in areas like Hesarghatta, Tumkur Road, Kolar to name a few. Team Estrade: Are you concerned about environmental and social sustainability in your Buildings? If so, what role does a green building play into your work? Mr. R.G. Sunil: We pursue towards our economic goals with a direction leading to sustainable future. “Akanksha” is our initiative for doing our bit for Mother Nature. Planting trees in sufficient numbers so that there’s no further depletion of green cover is the aim that drives Akanksha. This initiative encourages people to take a pledge to follow the green path by adopting an environment friendly lifestyle. Concorde is highly considerate towards safety from the forces of nature and therefore they have adopted Kum-Kang technology- a Korean technique to withstand adverse climatic circumstances. This technique uses concrete that gives tensile strength to the building increasing its durability. The technology also ensures optimal usage of resources with speeding up of the process to avoid unnecessary wastage of time and energy. Mr. R.G. Sunil: We are foraying into the accessible luxury category with our new project Crescent Bay on Bull Temple Road. We intend to do 6 launches in 2016-2017 across Bangalore. Our strength is the market understanding and catering to the needs of the micro market. We always look forward to delivering value and quality without compromising on the customers trust in us. Team Estrade: Your views on infrastructure in Bangalore, especially in terms of public transport? Mr. R.G. Sunil: Though Bangalore’s urban transportation challenges have not all been addressed, it’s undeniable that in last 3-4 years, good deal of improvements have been achieved through a slew of measures -some incremental and some significant. Namma Metro has seeped in the light of hope for many commuters across the regions in the city. Purple line – the East-West corridor is expected to increase the footfall in metro and connect people with the city like never before. Buses are Bangalore’s most popular mode of transport. The Bangalore Metropolitan Transport Corporation (BMTC), one of the oldest transport organizations in India, operates over 2,000 routes with a fleet strength of about 6,500 buses. Though BMTC aids to the longest routes, it lacks in its frequency therefore leaving a room of complaint in the riders. Elevated highways provide quick signal free connectivity to important hubs of the city be it E City or the airport. The Pedestrian facility was not given optimum attention but now with the emerging subways across the city, the walking space on roads look identified and adds value to the growing infrastructure of the city. The Tender Sure project that’s being implemented in CBD is also giving the city an international feel and giving pedestrians safer pathways.